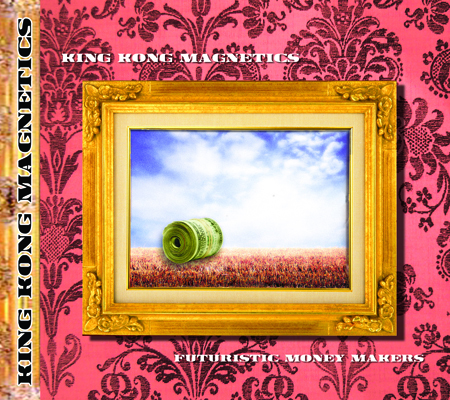 When I first set out expanding the "record label" aspects of Pancake Productions, probably the first artist I "picked up," so to speak, that I didn't know about before I'd begun to venture into the wild world of record distribution, was King Kong Magnetics. Straight-faced yet super-satirical hip-hop straight from the dark reaches of Saint Louis. Click the PayPal button down below to order a copy for $7.00 postage paid. King Kong Magnetics also have the third track on PP 000 (Pancake Productions Summer Sampler MMX) and the third-to-last track on PP 007 (Pancake Productions Wintry Sampler MMXI). The former is an unreleased track ("Mangia Girl"), the latter is "Gary Jagoff (Laid Back In Da Crib)" from PP 003 (click its name on this page to listen). Futuristic Money Makers was released in tandem with PP 006 (A Very Bert Dax Christmas, Volume Eight), on which their song "Kandy Kaynzez Mayne" appears, on 18 December 2010. Futuristic Money Makers may or may not contain hidden tracks.